Brewers Are Back Baby! ~ The Bucky Channel - The World of Sports from Wisconsin's Perspective. Home » Corey Hart , Jeff Suppan , Ken Macha , Milwaukee Brewers , Tony Gwynn Jr. » Brewers Are Back Baby! I can't take credit for any of this. Winks sent it to my email to post since he is at an Appleseed Cast concert in Madison. Not a big fan on this side of the computer, but to each his own. Anyway on to the crew. 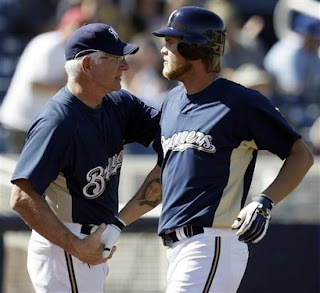 Given the way the 2008 season ended, I'm not really sure how to take what just occurred in the Brewers 2009 season opener. And by that I mean the fact that Corey Hart not only got the first hit of the new campaign, but also hit a home run. It's good to have you back, Corey. Could have used you in the playoffs though. The Brewers had good performances not only from Hart, but also Counsell (3 for 3), Kendall (3 for 3), and 1B hopeful Scott Thorman (2 for 2). Ryan Braun went 0 for 3 in one of the few appearances he'll have before he represents Team USA in the World Baseball Classic. Jeff Suppan went two innings on the hill, and gave up a run, while Jorge Julio got rocked. Elsewhere, Casey MaGehee got the start at 3rd, someone I left off my preseason roster but could very well easily make the Final 25. Basically, it's just good to have the Brewers back, no matter how insignificant the games may be. The Bucky Channel will have recaps of every game along the way as we did last season, including Spring Training. Usually, they will be posted sometime after the game, but if it's a weekend, then you can pretty much except them late Monday, due to how much we like weekends. Bear interjecting here: Go figure, a polarizing figure amongst Brewer fans (although I don't know why, he has never shown to be any good really in the minor or majors) Tony Gwynn Jr. will miss about a month due to a shoulder injury. Thus giving even more TGJ fanboys reason to claim hes never seen enough playing to show how good he is. Can you tell I am not really a fan? I think you could also expect most recaps to be shorter than bucks ones, writing over 162 of them will wear thin on us and you. First Box Score of the Season! No way baby! Dont be doubting on the length of my Brewers recaps! (Except the Spring ones will be short, you're right on that). Julio didn't get rocked ... he got slapped.